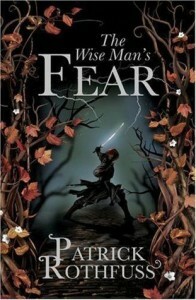 Patrick Rothfuss’ debut fantasy novel “The Name of the Wind” was a huge hit when it was released in 2007 so there was a great deal of anticipation about its sequel, the middle book in the Kingkiller series. I thought the original book was highly entertaining although also with some flaws so I was curious about whether Rothfuss would be able to improve on it in book two. I'm convinced that someday Patrick Rothfuss is capable of writing a superb fantasy series. However, I am increasingly doubtful that it's going to be this one. That's not to say the book isn't great fun to read, because it is - Rothfuss is a fantastic writer of prose and dialogue and even when not much is happening in the plot (which is quite frequent) the book is still entertaining to read. The plot has a lot of potential but ends up being a bit underwhelming and at times Kvothe's adventures do start to feel a bit formulaic. The overall plot of the series does have a compelling premise as Kvothe tries to track down the near-mythical Chandrian who killed his family, but despite the book being 960 pages long very little progress seems to be made towards that goal and at the end of the book little seems to have changed for Kvothe other than him learning a few new talents. Much of the first novel took place at the University where Kvothe was studying and arguably too many pages had been spent on his escapades there which were fun to read but increasingly repetitive and it is a relief when Kvothe leaves the University (albeit temporarily) a third of the way through the novel to go travelling. During his travels he is thrown into poverty for what feels like the hundredth time in the series, becomes an adviser to a powerful nobleman who wants help to woo a potential bride, attempts to find and stop a ruthless group of bandits, is kidnapped by an amorous faerie woman and is trained by the Adem, a civilisation of secretive martial arts experts. Some of the subplots along the way are definitely entertaining and occasionally surprising (for example, the extent of Kvothe's potential ruthlessness when dealing with the bandits or with a rogue band of travelling players) but few of the characters Kvothe meets on his travels are as interesting as some of the characters back at the University, although the enigmatic Count Bredon is one of the more interesting characters in the series. Kvothe’s time in the faerie world and his time among the Adem both seem to go on a bit too long and seem to rely on reusing a few fantasy clichés (particularly the Adem’s warrior culture). Kvothe is a slightly frustrating character as well due to his combination of being brilliant at most things he tries to do and being irritating foolhardy and prone to doing the worse possible thing at times. Despite that, he is charismatic and reasonably likeable, although I like the Kvothe from the framing story more than the one from the main storyline. Kvothe’s love interest Denna is also a frustrating character with her own secrets, I don’t find her to be a very likable character (I suspect she isn’t meant to be likable) but I can understand why Kvothe could become so obsessed with her. When the series is finished I think there is some potential for this book to seem better when re-appraised. There are quite a few hints that Kvothe may not be the most reliable of narrators and the story might become more interesting if it turns out that he hasn’t been entirely honest with some of his accounts of various events. Close inspection of the story does reveal quite a lot about the mythological background of the series that isn’t necessarily immediately apparent, and even if Kvothe doesn’t seem to learn much about the Chandrian through the book there are quite a few semi-hidden hints as to what their plans and motivations are. The potential unreliability of Kvothe’s narration does tie in to one of the main themes of the series, the process of storytelling and how the storyteller can shape the story to match what they want to say and their perspective. It is an interesting theme, although it is questionable whether it is interesting enough to justify three very long novels exploring it, and it is slightly frustrating when Kvothe doesn’t spend any time on some of his escapades because he claims that they weren’t important to the overall story he is telling. This is a good book that's a lot of fun to read, but it's also a bit disappointing because I think it had the potential to be a great book and a lot of that potential wasn't realised. Superficially it seems to be lacking in depth, closer inspection of the book does reveal more depth than is apparent at first glance, however I’m not sure there’s quite enough substance here to justify nearly a thousand pages.